Do you prefer to use non-strand-specific library prep methods, but need increased sensitivity and specificity from your RNA-seq experiments, from ever-decreasing amounts of input RNA? To address these challenges, our next generation of non-directional RNA library prep kit has been reformulated at each step, resulting in several fold higher yields of high quality libraries and enabling use of lower input amounts and fewer PCR cycles. The Ultra II RNA Library Prep Kit for Illumina is designed for non-directional (non-strand-specific) RNA library construction, and delivers significantly increased sensitivity and specificity from your RNA-seq experiments, from ever-decreasing amounts of input RNA. In conjunction with ribosomal RNA (rRNA) depletion or poly(A) mRNA enrichment, the kit enables the production of high quality libraries from 5 ng or 10 ng of Total RNA, respectively, up to 1µg. 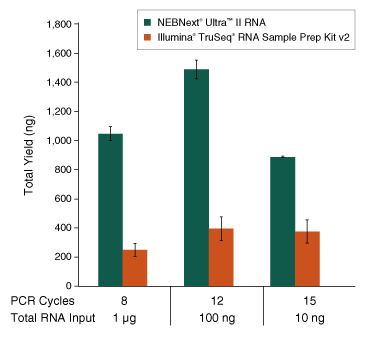 For directional (strand-specific) RNA library preparation, see the NEBNext Ultra II Directional RNA Library Prep kit for Illumina. See what customers are saying about NEBNext Ultra II RNA. Also available without optional SPRIselect® beads. Figure 2. 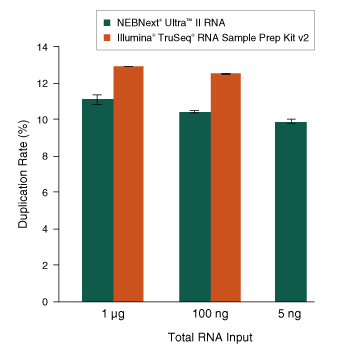 NEBNext Ultra II RNA with NEBNext rRNA Depletion results in lower duplication rates . Ribosomal RNA was depleted from 1 μg, 100 ng and 5 ng of Human Universal Reference RNA (Agilent #740000) using the NEBNext rRNA Depletion Kit (Human/ Mouse/Rat) or Illumina Ribo-Zero™ Gold rRNA Removal Kit (Human/Mouse/Rat). Libraries were then prepared using the NEBNext Ultra II RNA Kit or the Illumina TruSeq RNA Library Prep Kit v2, respectively. 5 ng input was tested only with the NEBNext kits. Libraries were sequenced on an Illumina NextSeq® 500 using paired-end mode (2x76 bp). Reads were down sampled to 10 million read pairs and mapped to the hg19 reference genome. Duplication rates were calculated as a fraction of uniquely mapped reads using the ‘Read Duplication’ tool of RSeQC where reads mapping to the same genomic location are regarded as duplicated reads. Poly(A)-containing mRNA was isolated from Human Universal Reference RNA (Agilent #740000), and libraries were prepared using the NEBNext Ultra II RNA Kit (plus the NEBNext Poly(A) mRNA Magnetic Isolation Module), and the Illumina TruSeq RNA Sample Preparation Kit v2. Input RNA amount is indicated. Libraries were sequenced on an Illumina® NextSeq® 500 using paired-end mode (2x76 bp). 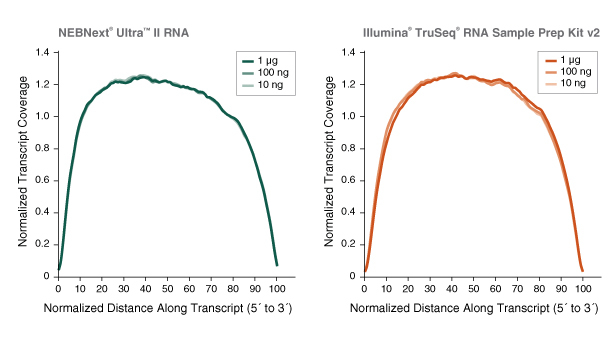 This view of the 5´ to 3´ coverage of RefSeq transcripts reveals consistent coverage for Ultra II RNA libraries as input RNA is decreased from 1 μg to 10 ng. The changes apparent in The TruSeq kit results from loss of coverage at the 3´ end of some transcripts. Ribosomal RNA was depleted from 1 μg, 100 ng and 5 ng of Human Universal Reference RNA (Agilent #740000) with recommended amounts of ERCC RNA Spike-In Mix I (Thermo Fisher Scientific #4456740) using the NEBNext rRNA Depletion Kit (Human/Mouse/Rat) and libraries were then prepared using the NEBNext Ultra II RNA Kit. Libraries were sequenced on an Illumina NextSeq® 500 using paired-end mode (2x76 bp). Salmon 0.4.0 was used for read mapping and quantification of all ERCC transcripts. R2 values for linear fit are shown. 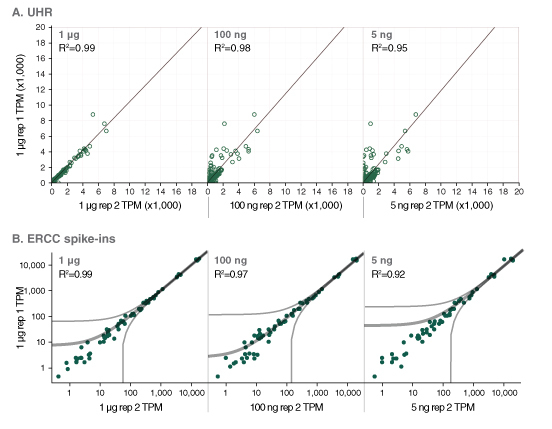 TPM (Transcripts Per Kilobase Million) correlation analysis of the transcripts indicates excellent transcript expression correlation between the different inputs for Ultra II RNA libraries (A), including ERCC transcripts (B). What is the difference between the NEBNext Ultra II RNA Library Prep with Sample Purification Beads (NEB #E7775) and the NEBNext Ultra II Directional RNA Library Prep with Sample Purification Beads (NEB #E7765)?